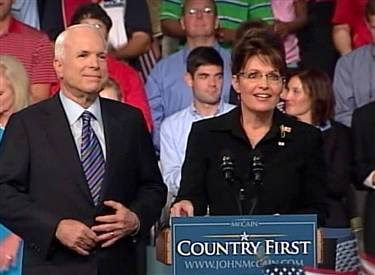 John McCain is trying desperately to get the female vote, as he announced today that his running mate will be Alaska Gov., Sarah Palin. This is a shocker in the world of politics, especially for republicans. Palin becomes the first female to serve on a GOP presidential ticket, just two years after she was elected the first female governor of Alaska. Personally, I think if McCain was going to get a female running mate he would have been good with Condoleeza Rice. She's vicious, she's experienced and she's respected. However, getting a woman was probably a stretch for McCain anyway, so I'm sure getting a black woman might have sent the old candidate into cardiac arrest. To read more about Sarah Palin click here. Be sure to watch the Republican National Convention, which starts Monday. It always good to know your opponent.